Fishnet Wrapped Mason Jar For A Beachy Look! Having a unique and standalone idea is always very critical, especially when it comes to art and craft. 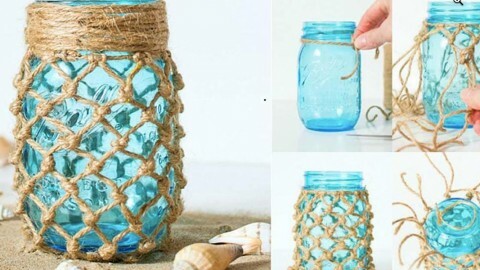 Following is a tutorial given by a lady which transforms a mason jar into a light blue oceanic theme with the help of paint colors and some hand knotting magic on the strings. Although the overall look appeals the viewer that it is hard to make but this tutorial makes ridiculously easy to make. Some people, who have a craving from beaches and oceans will surely fall for any piece of art that symbolizes ocean and beach. There is such a tranquility in blue color that its depth catches every aspiring breath of ocean and beach lovers. This type of art product is an ideal gift item for these people as they post on social media about similar related stuff all the time. One such example is of my cousin who loves to put anything that enhances or represents the beauty of beaches and ocean on her Facebook. She will probably end up getting a beach house and she definitely needs a beach item to décor her house, this item is perfect for her! Watch the tutorial below to see how to make your own oceanic theme mason jar !